It is unusual to think of lipids when considering the fight against bacterial infections. However, we might be grateful that some people do, because they may be on to something that looks very promising for producing new antibiotics. There is compelling evidence that a group of lipids forms a canonical system that produces the bacterium’s protective coating. Without this coating, called the cell wall, the bacterium leaks and dies. Stopping the enzymes that form the cell wall are therefore targets for treating the infection. The research into this pathway and the chemistry of the cell wall is becoming increasingly important in fighting infection. Many existing antibiotics, such as vancomycin, that also exploit weaknesses in the cell wall, are becoming less and less effective as bacterial resistance grows. This increases the need for alternatives. The canonical pathway that produces the cell wall provides a number of targets for medical intervention that could treat the infections of a number of bacteria. The canonical pathway is shown below (Figure). What it represents is the way in which fragments of the cell wall are build up by the activity of enzymes on lipids. The lipids are therefore being used as a sort of chemical production line. The head groups of those lipids are what become the fragments of the cell wall. At the bottom left of the diagram, the hydrophobic component from lipid II is dephosphorylated. Then a protein (enzyme) called MraY [1,2] attaches a sugar (pink hexagon, ‘M’) that has a short peptide on it, to produce lipid I. Lipid I is turned into lipid II by another enzyme, MurG [3,4]. In this reaction, another monosaccharide is added. Lipid II is flipped from the inner face to the outer face by FtsW , allowing the penicillin-binding proteins (PBPs) to sew it into the developing cell wall. The hydrophobic component of lipid II can then be re-used. Figure. The formation of fragments of the cell wall (top left of diagram) from lipid II. 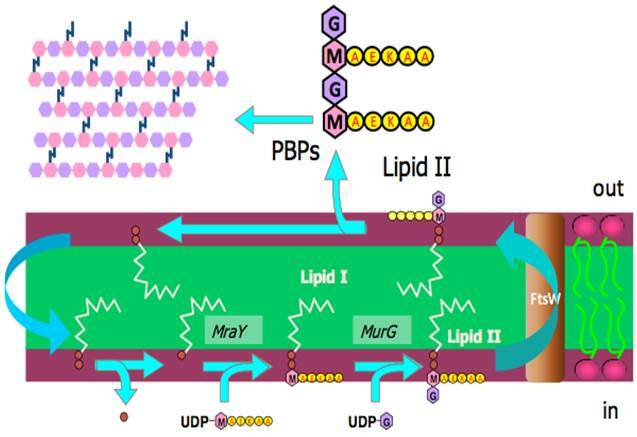 Lipid II is formed in the inner face of the plasma membrane, the past step of which is performed by MurG before the lipid II is flipped to the outer face by the protein FtsW. Lipid II is made from lipid I, Lipid I is made from a recycled component of lipid II. Coloured hexagons represent monoaccharides, red discs are phosphate groups, the yellow discs marked AEKAA represent a peptide. PBP = penicillin-binding proteins. Diagram courtesy of Drs Eefjan Breukink and Tamimount Mohammadi. Much work has gone into elucidating this pathway [1-5], in order to ensure that all the components are properly characterised and their roles understood. The understanding of these components provides a valuable set of targets for tackling bacterial infection. The activity of MraY, MurG and FtsW are all important for the formation of the pieces that make up the cell wall, and so anything that inhibits their activity has potential as an antibiotic. Watch this space! D. S. Boyle, W. D. Donachie, J. Bacteriol., 1998, 180, 6429-6432. B. C. Chung, J. Zhao, R. A. Gillespie, D. Y. Kwon, Z. Guan, J. Hong, P. Zhou, S.Y. Lee, Science, 2013, 341, 1012-1016. D. Mengin-Lecreulx, L. Texier, M. Rousseau, J. van Heijenoort, J. Bacteriol., 1991, 173, 4625-4636. E. van den Brink-van der Laan, J. W. P. Boots, R. E. J. Spelbrink, G. M. Kool, E. Breukink, J. A. Killian, B. de Kruijff, J. Bacteriol., 2003, 185, 3773-3779. T. Mohammadi, V. van Dam, R. Sijbrandi, T. Vernet, A. Zapun, Ahmed Bouhss, M. Diepeveen-de Bruin, M. Nguyen-Disteche, B. de Kruijff, E. Breukink, EMBO J., 2011, 30,1425–1432.